Upon entering our office, you will be welcomed as a member of our family. If you have not completed the new patient application for care prior to arriving at the office we ask that you arrive 15 minutes prior to your scheduled appointment so that paperwork can be completed at that time. This paperwork provides us with your health history and information on your condition. Next, you will have a consultation with Dr. Kyle Gillett to discuss your health-related problems, concerns, and potential treatment options. This initial visit is designed for Dr. Kyle Gillett to learn more about you, your condition, and expectations to determine how chiropractic care can meet your goals. 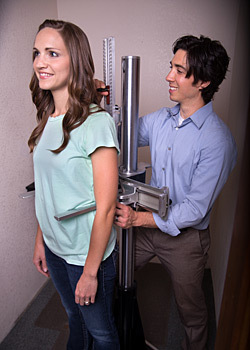 A detailed physical examination will be performed to better assess your condition including range of motion, posture analysis, orthopedic checks and thermography. The nervous system uses vasoconstriction and vasodialation of the capillary beds to help regulate body temperature. Irritations cause the skin’s natural temperature symmetry to fall out of balance from the left to the right side of the spine. State of the art technology will be used to detect these areas of asymmetry as well as abnormal warm and cool areas. If based on the findings of the consultation, physical exam and thermographic scan you are determined to be a candidate for NUCCA care x-rays of the head and neck will be taken from several different angles. 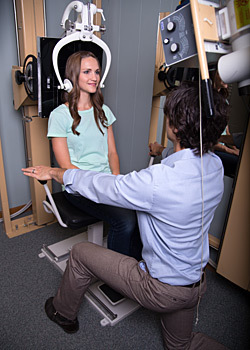 These x-rays are necessary to determine the direction and degree of spinal misalignment and how to properly restore the proper head and neck relationship. A detailed analysis of your x-rays will be performed and the result will be discussed with you at the report of findings on your next visit.